Then SO(2,4) corresponds to conformal compactification of the Minkowski space. Via the isomorphism SO(2,4)~SU(2,2) this is related with Penrose's twistor theory. 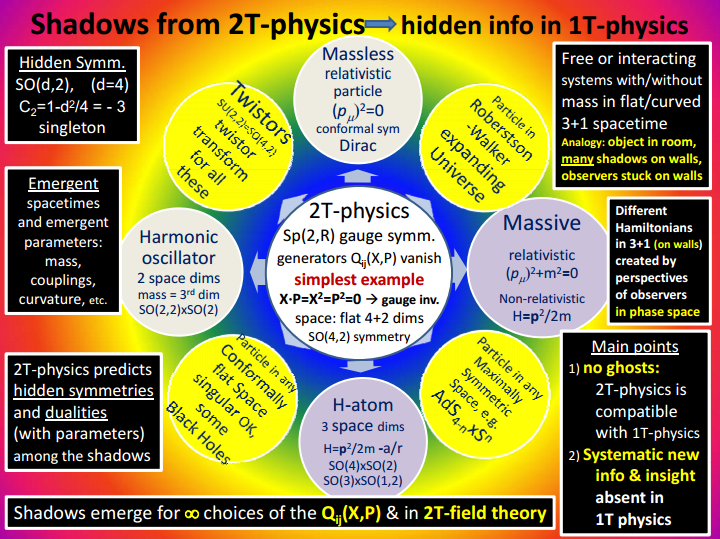 So how do we get from SO(2,4) to quantionic quantum mechanics? Last time we were after obtaining a unique element which would play the role of sqrt(-1). That element turns out to be a bivector \(e_i \wedge e_j\) where \(e_i\) is from the 2 part of SO(2,4), and \(e_j\) is from the 4 part of SO(2,4). Then we want to find out all the elements of SO(2,4) which commute with this. Skipping the lengthy derivation, one arises at a complex linear Minkowski space where the four-vectors are no longer real numbers, but complex numbers. Here we follow again the amazing book of Grgin. We need to arrive at an associative algebra which describes the new quantum mechanics number system. We need to have associativity because quantum systems can be combined in an associative manner using the tensor product. We also need to recover the usual complex number formulation of quantum mechanics in the appropriate non-relativistic limit. Is there a linear functional \(\Omega\) which takes a complex Minkowski 4-vector into a complex number? If so, this would seem to violate the spirit of relativity. However, in the C* algebraic formulation of quantum mechanics any C* algebra can be made unital and \(\Omega\) turns out to be the unit of the new quantum mechanics number system. Physically this corresponds to specifying he direction of time at each Minkowski space-time point. A distinguished direction of time seem to contradict relativity but in the end it will all work out nicely when we'll add the interpretation of the inner product, so please have patience on this. Next time we'll see how to arrive at the matrix formulation and SL(2,C). We'll also see that the above decomposition is related to the CPT theorem. Please stay tuned.